Model AVM-3-C provides amplitudes up to 15V, with pulse widths from 2 to 15 ns. The rise time is less than 150 ps, and the fall time is less than 600 ps. The pulse repetition frequency is variable from 3 kHz to 25 MHz on all -C models in the AVM Series using the internal clock oscillator, which is controlled by a six-position front panel switch and a one-turn fine control. 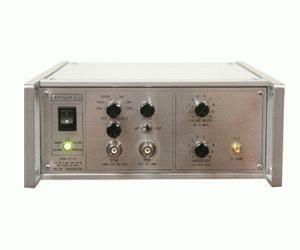 A delay control and a sync output are provided for sampling scope triggering purposes. The units can also be triggered externally using a TTL level pulse. The output amplitude and pulse width for the AVM series interact to the extent that for a given pulse width setting, decreasing the output amplitude increases the output pulse width. This interaction may be eliminated by using external variable attenuators to control the amplitude or by using the 300 ps rise time AVMM series. The AVM series is ideally suited for systems or laboratory applications such as logic testing, TDR, radar, optical and cable communications, SAW, nuclear, switching and propagation time studies and educational fields. In some cases, the specifications can be adapted to satisfy a particular requirement.